A three-day meal plan can jumpstart your heart-healthy diet. This 1,200-calorie plan can help most women lose weight. Breakfast: 2 large eggs, 2 slices whole grain bread, 1 Tbsp. olive oil spread. Lunch: 2 slices whole grain bread, 3 oz. tuna (canned in water), 1 slice low-fat mozzarella cheese, 1 Tbsp. olive oil mayo. Dinner: 4 oz. grilled chicken, 1 medium Idaho baked potato, 1-1/2 cups green beans. Snacks: 1 cup skim milk, 1 medium apple. Breakfast: 1 cup oatmeal, ½ cup blueberries, 1 Tbsp. peanut butter. Lunch: 2 slices whole grain bread, 2 oz. low-sodium turkey, 1 slice Swiss cheese, 1 tsp. mustard; 1 cup skim milk. Dinner: 4 oz. salmon, ½ cup brown rice, 1-1/2 cups broccoli, 2 tsp. olive oil, 1 Tbsp. grated Parmesan cheese. Snacks: 6 oz. non-fat plain Greek yogurt, ½ cup strawberries. 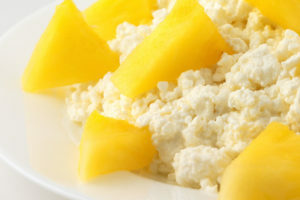 Breakfast: 1 cup fat-free cottage cheese, ½ cup fresh pineapple. Lunch: 3 oz. grilled chicken, ¼ cup bell pepper, ¼ avocado, 2 Tbsp. salsa, ¼ cup shredded lettuce, 1 low-carb wrap; 1 medium peach. Dinner: 3 turkey meatballs, ½ cup whole wheat pasta, 1/3 cup marinara sauce, 1 Tbsp. Parmesan cheese; 2 cups spring lettuce mix, 1 Tsp. olive oil, 1 Tbsp. balsamic vinegar. Snacks: ¼ cup mixed nuts, 2 Tbsp. dried cranberries. The typical American diet contains too many high-calorie foods devoid of nutrients: soda, chips, crackers, cookies and candy bars. They add to your weight, and raise your blood sugar and bad LDL cholesterol levels. High-fiber carbs (like whole grains and legumes) are always better than simple carbs, like sweets, snack foods, chips, and white bread, pasta or rice. 1200 calorie meal plan heart-healthy meal plan.